Lake Tahoe – The “Most Beautiful Drive in America”! Today I woke up and decided to enjoy the BEST of Lake Tahoe by enjoying the scenic drive around the Lake which has been named one of the “Most Beautiful Drives in America”! Driving around Lake Tahoe is 72-miles and can take anywhere from 3-4 hrs to all day. I recommend spending the entire day to do the drive in order to give you plenty of time to stop along the way at all of the marvelous spots to see! This is a perfect activity to enjoy during the spring months of April and May before the summer beach crowds flock in, traffic is minimal and picnic grounds, beaches and hiking trails are nearly empty. 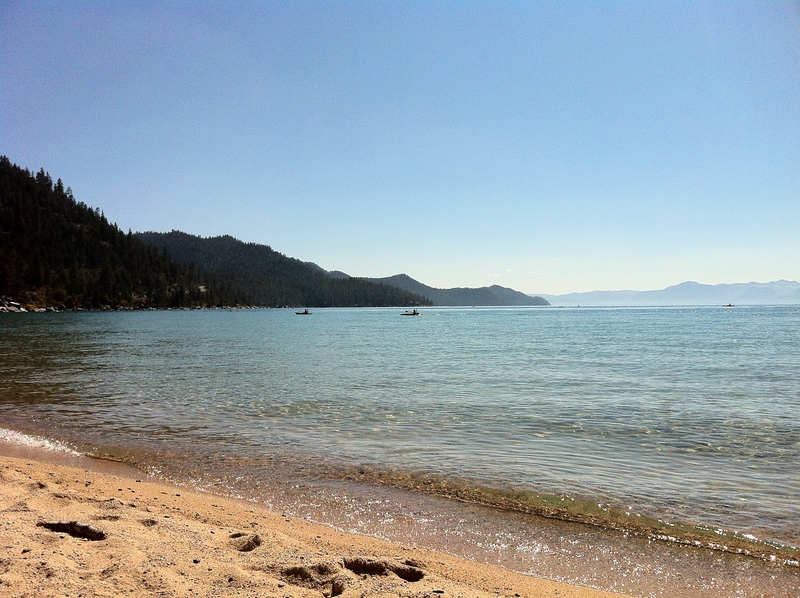 First stop, Sand Harbor State Park, my favorite beach in Lake Tahoe. It’s a spectacular expansive, sandy beach with far-off distance views of the Thunderbird Lodge. When I am here I feel like I am back in Hawaii. It also has picnic areas, a boat launch, a restaurant and home of the Shakespeare Festival each summer. Next, drive along the East Shore enjoying views of Lake Tahoe, the crystal-clear clarity of the water and the rocky outcroppings that make the East Shore famous. You will pass through Cave Rock and I recommend stopping at the Cave Rock Vista Point, once a sacred site of the native Washoe Indians. Cruise into South Lake Tahoe where you will be greeted by Casinos, Hotels and a Golf Course, take a break and place a bet if you are feeling lucky! Welcome to California! Travel west on Highway 50 and soon you will be rewarded with what are my favorite sightseeing wonders along Lake Tahoe’s East Shore. 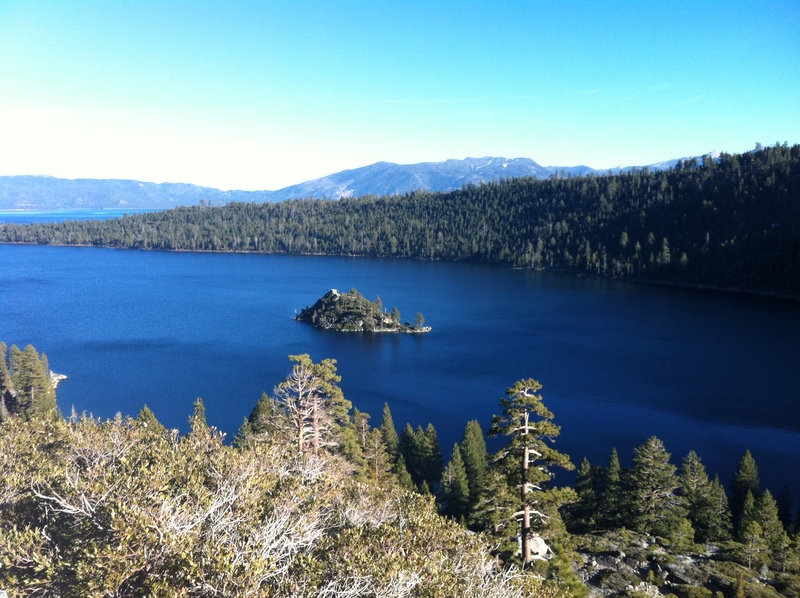 First, head to the Emerald Bay Lookout which offers break taking views overlooking Emerald Bay, Fannette Island and waterfalls season depending. Emerald Bay is famed one of the most photographed places in the world. Next, you will reach D.L. Bliss State Park, a secluded beach and picnic area with views of the renowned Rubicon Bay. Afterwards, keep traveling until you reach Sugar Pine Point State Park, home of the Hellman-Ehrman Mansion, picnic grounds, hiking and biking trails and great kayaking location in the summertime. 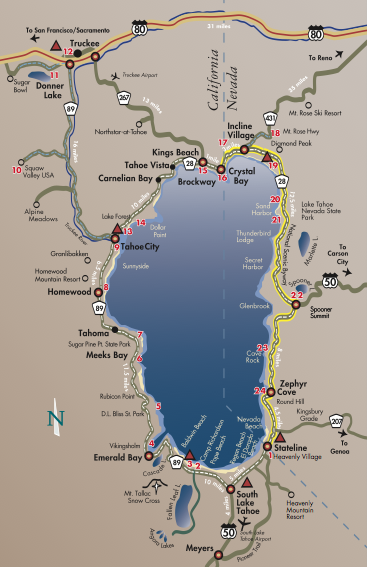 Last, travel along the East Shore enjoying views of quaint cabins and piers, you will reach Tahoe City. Here take a break at Fanny Bridge and overlook as waters rushes into the Truckee River from the only outlet in Lake Tahoe. Stroll along the sidewalks of Tahoe City and reward yourself with shopping, coffee and afternoon snacks. As you return to North Lake Tahoe you are greeted by the “Welcome to Nevada” sign near Crystal Bay. End your journey by taking a moment to stop and traverse up the State Lookout Trail to enjoy stunning views of Lake Tahoe at sunset to end your remarkable day! If this has inspired you to enjoy the drive around Lake Tahoe on your next visit to the area check out the Most Beautiful Drive in America’s website to learn more about the journey, places to stop and even download a copy of driving map featured in this blog. What is your favorite place to stop and visit while driving along Lake Tahoe? Please share your favorite spot in the comments below. Enjoy learning about Lake Tahoe? Follow my blog and me at @robinpenning to receive information on tips, news, activities and special events in Lake Tahoe.